Family owned business. Extremely helpful and friendly. Great location! The hosts are really kind and helpful: they gave us a lot of tips about what to visit and where to eat. 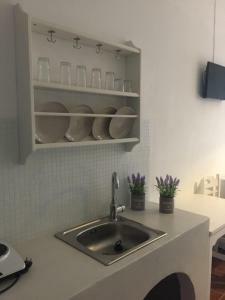 The location is perfect because it is within walking distance to the city center and the bus station. They provide a free transfer from and to the port. Gran lugar para alojarse! Muy buena atención. Nos vinieron a recoger y dejar en puerto. Cerca del centro. Terraza magnifica con vistas muy bonitas! Muy recomendable! la posizione dell'appartamento molto fresco e si dorme benissimo. Posizione fantastica, proprietaria molto gentile e disponibile ad ogni richiesta. La disponibilità di Ergina e della sua famiglia è davvero unica, la posizione sopra alla Chora è perfetta per vivere il villaggio. Situation parfaite par rapport à la ville de Chora, très bon accueil et conseils des hôtes. Terrasse avec jacuzzi très agréable. Lock in a great price for Ergina Studios – rated 8.9 by recent guests! Set in Ios Chora in the Ios Region, 2,950 feet from Yialos Beach, Ergina Studios features a barbecue and hot tub. Free WiFi is offered . All units are air conditioned and have a TV. There is also a kitchenette, equipped with a refrigerator and stovetop. There is a private bathroom with a bath or shower in each unit. Towels are featured. Ergina Studios also includes a sun terrace. Free private parking is available on site. When would you like to stay at Ergina Studios? This twin/double room features a stovetop, kitchenware and tile/marble floor. This studio has air conditioning, tile/marble floor and kitchenware. House Rules Ergina Studios takes special requests – add in the next step! Ergina Studios accepts these cards and reserves the right to temporarily hold an amount prior to arrival. Please inform Ergina Studios of your expected arrival time in advance. You can use the Special Requests box when booking, or contact the property directly using the contact details in your confirmation. The cooking plates weren't working properly, as well as the Wi-Fi. Anyway it didn't affect the goodness of our stay.